Monday has come and gone. This means I should have written and posted this two days ago. After all, #mondaygratitude is on MONDAY! But, life happens. I decided to take my nieces and meet up with friends and their kiddos and catch a Red Sox game at Fenway. That is my number one reason to be grateful this week, it is also the number one thing that brought me joy! So, without further ado. Going to a game at Fenway. 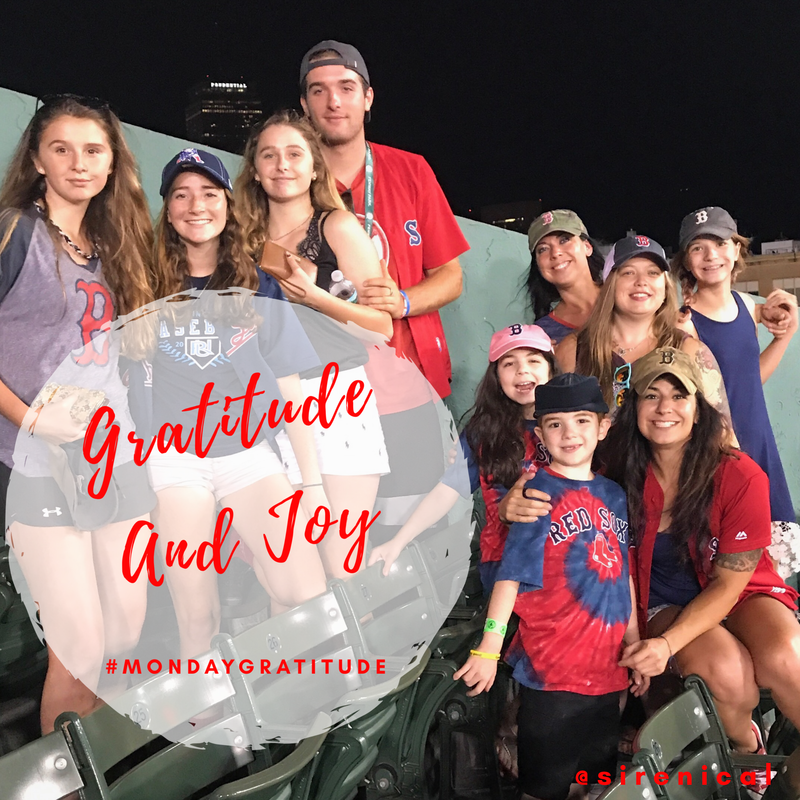 Being able to take the time from work, being able to take my nieces to their first game at Fenway, having friends who are down for last minute shenanigans, are all reasons to be grateful. Having a job that I enjoy with bosses that understand that life is about living. I never dread going to the office and how can you not be grateful for that? Music is not one of those things that I connect to like some people. Sure, I love music, some songs really connect, but on the whole, it’s always just been a fun thing. This year I have been listening to more live music. It has opened me to music I wouldn’t always choose to listen to and found I love and has added layers to connections with friends. Double dipping, but going to a game at Fenway definitely brought me a ton of joy. The action, the music, the friends, the atmosphere, the energy, all of it! Going to see A Tribe Called Red last week and dancing the night away. I was inspired and awed and exhausted after. It was absolutely incredible. Getting back on my skates last night and making it to derby practice! It hurt so good and despite losing some of my skating conditioning, I was still smooth and controlled. I felt like I was smiling non-stop! What did you do this week that brought you joy?